That's the main complaint most non-golfers have about golf – it's so darn boring. My girlfriend and I have completely wasted spent way too much time thinking about a way to inject some fun into the game commonly referred to as a beautiful walk spoiled by a small white ball. The carts have inspired what we believe to be the ultimate solution – a cross of golf with European style rallycross. We call this exciting new sport Golfkhana. Like ordinary golf, the object is to start at one end and sink your ball into the hole at the other. Instead of walking, you drive the cart the whole way. 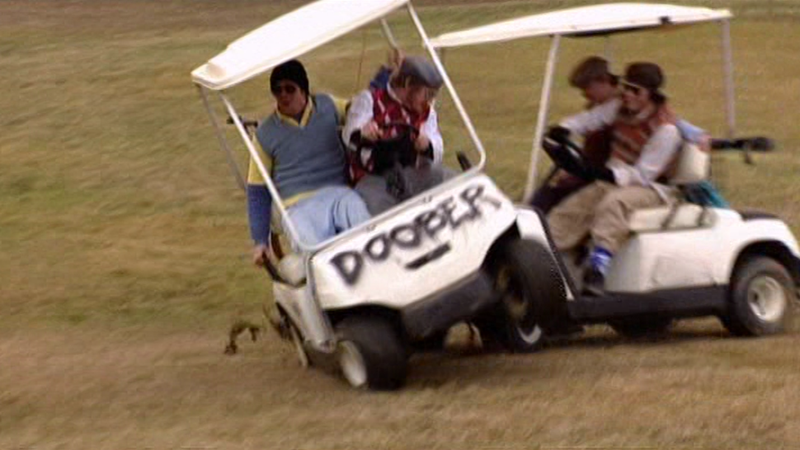 Since it is difficult to drive and whack a ball at the same time, each cart has a driver to drive the cart, and a co-driver to manage the clubs, make the swings, and otherwise assist with general chaos and mayhem. To keep the action moving at a pace faster than that of paint drying, we don't bother with pars or strokes or any of that foolishness. It's all about how fast you can sink your ball in the hole once the green flag drops. There are 18 holes on the course, and times from start to sink are added up cumulatively like a stage rally. But unlike a rally, where cars run one at a time, in Golfkhana everyone runs at the same time. It's a wheel to wheel, club to club race from the starting line to the hole. This format can provide for a wide variety of interesting tactics that teams may choose to employ. You can focus on speed and make a flat out attempt to go straight for the hole for the fastest possible stage time. Or you can play an offensive game, slowing your opponents down by nefarious means. You can drive alongside your opponent and have your co-driver try to steal their clubs, for instance. It's legal to knock your opponent's ball into a water trap. It's even legal to knock your opponent's cart into a water trap. There are no rules against cart to cart contact. People watch NASCAR for the crashes, so why not give the people what they want in Golfkhana? Of course, standard golf carts aren't very fast, so modifications would be permitted. We may have to set a displacement limit so nobody tries this with something like an STi powered quad, but certainly some extra speed will be necessary, as well as roll cages. Because safety is, like, important or something. I think Golfkhana has some real potential as a great new motorsport, for participants and especially spectators. Imagine Golfkhana coverage on TV. There's time for a commercial break between each hole, but it's action packed enough to keep the attention of short attention span viewers who only watch it for the crashes. It might even be enough to get me to actually watch the Golf Channel.